Colorado unleashed what effectively has become a new tourism attraction back in January when it legalized the sale of marijuana for recreational purposes. And now I can say I was part of that new wave of marijuana tourism—at least to a small extent—as part of my trip earlier this month to Boulder. I have to admit that I never really enjoyed smoking pot (I’m not a smoker anyway). Indeed, the last time I smoked or “inhaled” was back in my college days in the 1980s (yes, I admit I inhaled back then). But I was never into the "scene" or culture that seemed to revolve around marijuana back in college. Once we arrived in Boulder we Googled “recreational marijuana” (as opposed to “medical” marijuana) and came up with two locations. The only one that was truly in Boulder was a place called Terrapin Care Station just a couple of miles from our hotel. The store opened only in February just after Colorado legalized the sale of marijuana for recreational purposes. We drove to a fairly non-descript office with a small sign and entered a reception area with a simple desk. We were escorted through a door to another room in the back to buy our pot. A bearded marijuana concierge gave us the options: Did we want to be “giggly,” “mellow” or “paranoid.” Well, the last is an exaggeration of sorts (we certainly didn’t want to be paranoid). You can buy a quarter ounce each (at a fairly reasonable price), which our pot concierge promptly put in a plastic container. We then figured out we had no “delivery” mechanism, so we purchased some rolling papers and a lighter. It was only back at the hotel that I realized I didn’t know how to roll a joint (a talent that I’d never acquired since I was always handed one by someone else in college). I found an instructional video on YouTube, but still couldn’t figure out how to do it without more study. In the end, we walked down to a head shop in Boulder and bought a small, cheap pipe. Of course, then we had to figure out where to smoke it. We couldn’t smoke in the hotel (really!) since it’s non-smoking. We couldn’t smoke in the car because even the Boulder police frown on that sort of thing. And we technically couldn’t smoke in public. We ended up on a park bench near the river at a secluded spot at night, which itself wasn’t probably legal in the city. Okay, truth be told, my experience legally buying and smoking pot in Colorado wasn't so bad! But I really did not travel to Boulder just hit the pot stores. Instead, I wanted to enjoy this small city with spectacular views, fresh mountain air, fresh water and a thriving college scene at the University of Colorado at Boulder. We stayed at one of the top properties in Boulder, the St. Julien Hotel & Spa, a modern, Frank Lloyd Wright-like structure with a large spa and indoor pool (I guess these days a “pot” tour is a very different type of experience). The property offered very comfortable accommodations and also had nightly entertainment, including a samba music group in the lobby that had the whole place dancing. But you can also find alternative and classic accommodations at the Boulderado, a hotel originally built in 1909 but now undergoing renovation. The lobby is a blast from the old West with décor to match. 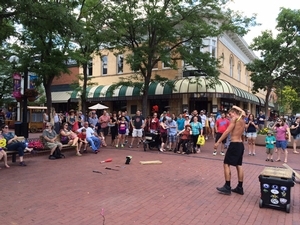 Boulder also has one of the most vibrant downtowns in Colorado centered on Pearl Street, a pedestrian thoroughfare that has great restaurants, shops, bars and street performers. We enjoyed dining at such restaurants in downtown Boulder as Salt, the Mediterranean House, The Kitchen and Brasserie Ten Ten. We also visited another new restaurant, Basta, located in a residential complex just a couple miles away from downtown. It had great wood-fired pizzas and chicken on the menu. On Pearl Street, we browsed such curiosity shops as Into the Wind, which offers all kinds of kites, as well as joke gifts. We also spent a bit of time in Rocket Fizz, which features almost every kind of soda flavor you can imagine—and some you cannot or maybe don’t want to. The store also sells vintage candy by the decade. 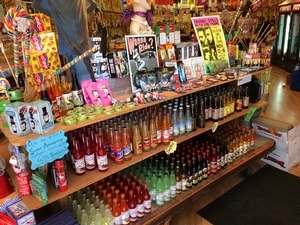 PHOTO: Rocket Fizz on Pearl Street in Boulder offers more soda flavors than you can imagine. On the Saturday we were in town we went to the Boulder Farmer’s Market next to the city’s Central Park. There you can find all manner of fresh produce, fruits, breads, chocolates, salsa, pastries, meats and cheeses, and much more. Next to the Farmer’s Market is an outdoor food court offering a wide variety of fresh foods for lunch, although we had already gorged ourselves by tasting much of the food at the market. We also hiked the trails at Colorado Chautauqua, a national history landmark, on the side of the mountain. Chautauqua is a planned cultural and educational summer retreat first established in 1898—call it the first adult summer camp. Today its cottages can be rented out for days and weeks; you can eat breakfast, lunch and dinner at the Chautauqua Dining Hall; and listen to a concert or concert rehearsal in the Chautauqua Auditorium. 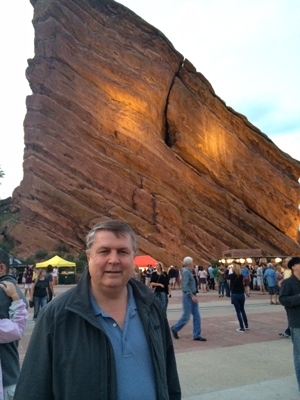 On our last night in town we drove about 30 minutes towards Denver to experience Red Rocks, the giant natural amphitheater that since 1941 has served as the venue for so many incredible rock, pop and other musical performances. Located in between two giant red rocks, this outdoor theater has a capacity of more than 9,500 people. PHOTO: The famed Red Rocks amphitheater is a spectacular setting for rock acts. We saw a performance by the Avett Brothers, which was great, but the real stars of the evening were the stars above, the spectacular sky and giant moon that glowed in the distance above Denver as we watched the stage below us. And yes, it was at Red Rocks that we realized we might have wasted our money buying pot back in Boulder. Like all nearly all rock performances, it was all around us. But I didn’t inhale! All in all, it was a great way to end our visit to Boulder. With all of the attractions the city offers, the recreational marijuana store is probably one of the least interesting…though these days it’s probably the thing that gets all a lot of attention from at least some tourists to Colorado! ?